Preheat grill to medium high heat (about 400 degrees). In a small bowl add garlic powder, cumin, coriander, smoked paprika, sea salt, and black pepper. Stir together. Sprinkle the spice blend over the chicken legs and rub spice blend all over the chicken. Place the chicken on the grill and grill each side for 2-3 minutes on medium high heat. Turn heat down to medium low heat and cook chicken an additional 20 minutes or until juices run clear and internal temperature of the chicken is 175 degrees. In the meantime add garlic clove, fresh cilantro, fresh oregano, lime juice, red wine vinegar, olive oil, salt and pepper to a food processor. Blend until smooth. 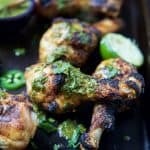 Serve chicken and top with chimichurri sauce!